The Aztec civilization was a highly advanced and filled with unique customs, a comprehensive language, and amazing technology. The history of the Aztec civilization is one that has long been admired and studied by people around the world. The Aztec economy was very specialized and intricate. A variety of goods were produced within the Aztec empire, including tools, pottery, figurines, jewelry, cloth, and baskets. These goods were either made specifically for the ruler or sold in the local markets. Other goods, however, were carried to the lowlands of the Gulf Coast, which is now Guatemala, and traded. These prized goods included items such as gold ornaments, salt, and garments made of fine clothe. Items valued within the Aztec culture, such as jaguar skins, tropical-bird feathers, rubber, cotton, chocolate, and cacao beans were received in return. These items were valuable to the Aztec Indians as they were used within many of the ceremonies, rituals, and other traditions of the Aztec people. Getting their goods to the lowlands was a particularly extraordinary ordeal for the Aztec Indians. Since the Aztecs did not have draft animals or wheeled vehicles, goods had to be carried by canoe. When this wasn’t possible, goods were carried on the backs of porters in long caravans. Aztec warriors also went along on trades, as they were needed to protect the caravans in dangerous areas. The merchants also played another important role in the Aztec civilization, as they would act as spies for the Aztec empire when they visited lands still unconquered by their people. The development of the Aztec language, or Nahuatl, also played an important role in their civilization. Pictographs were used to represent their written language. The language, both written and spoken, was important in completing business arrangements and in keeping track of family and cultural histories. The Aztec language was also used to create beautiful poetry and other prose used in rituals and ceremonies. Many Aztec customs relied on the use of their language, as did the passing down of their legends and beliefs from one generation to the next. Tenochtitlan was an island city at the center of the Aztec empire. At one point, this city had a population of about 200,000 people. The Great Pyramid was located here, which was the primary spot for religious ceremonies and rituals. 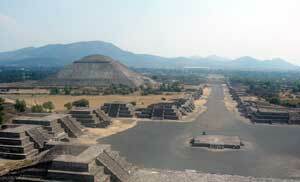 Smaller pyramids were also located throughout Tenochtitlan. On these pyramids, incense and sacrificial fires were continually burned. The advanced Aztec technology made it possible to build these grand step pyramids, which sometimes stood over 100 feet tall. In keeping with the overall tone of the Aztec civilization, nobility lived in brick or stone homes while the common people lived in homes made of interwoven mud and twigs. Tenochtitlan played an immensely important role in the Aztec civilization because of the large population living there, as well as the abundance of religious buildings and activities that took place there.